August is here, which means that summer vacation is winding down, and many of us will find ourselves back in class at the end of the month. 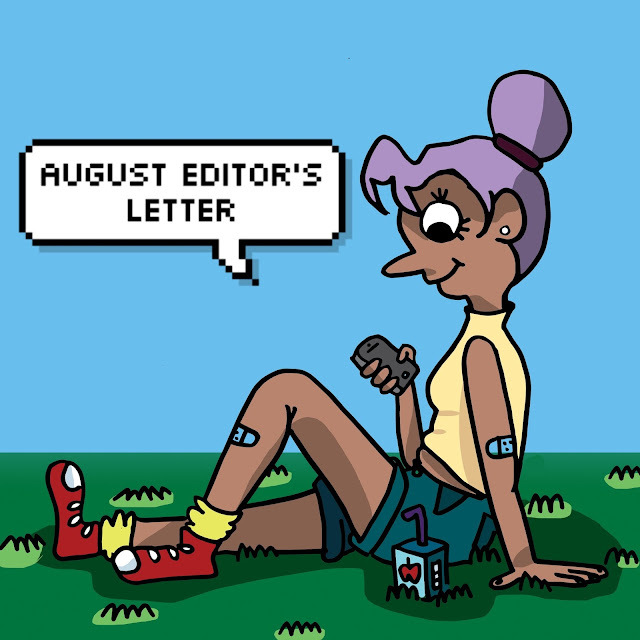 Whether you're spending August lounging by the pool, trying to cram in summer reading, or shopping for new dorm stuff, don't forget to stop by and see some of the new content being published this month! On the 4th, our fashion masters will be serving looks in the summer edition of our seasonal lookbook! Also, keep your eye out for our monthly installment of Riseponds! This month we will be discussing how we feel social media has changed the way we communicate, and I've got a serious beef to hash out with Snapchat. We have a handful of beautiful reader submissions going up this month as well. We love seeing your work, and encourage that you to go read up on the guidelines and send us a piece! Risen is a space to create, and that includes you! We also appreciate all and any feedback on our work! Shoot us a quick message at risenzine@gmail.com to let us know what you'd like to see from us, or any other comments you wanna share! We have also been working hard to stay active on our Tumblr! Check our Instagram for updates on the site, current event news, and smaller creative pieces. I am very bad at writing these letters, but Jaz is on vacay, so I am trying my best.